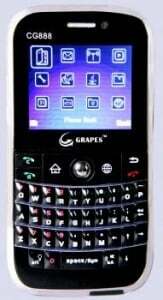 Grapes Mobile, the mobile handset brand of Unitron Exim today announced the launch of new multimedia QWERTY Mobile Phone CG888 at Rs.4999 in India. The Grapes CG888 Mobile phone comes with flexibility for GSM and CDMA SIM card slots. It can be used as GSM + GSM or GSM + CDMA as per users suitability or needs. With the phone users have the option of inserting either a GSM SIM or CDMA SIM (800 MHz) in the second SIM slot. As Social Networking is getting the trend of young generations, the handset has a facebook client and MSN and Yahoo Messenger for Instant messaging.The handset also equipped with all multimedia features like 2” QCIF screen with brilliant 65K colours, 1.3 MP camera, web camera, 1500 mAH battery for considerably longer talk time and standby time, memory expandable up to 2GB, 2” QCIF screen with brilliant 65K colours, 1.3 MP camera, web camera, 1500 mAH battery for considerably longer talk time and standby time, memory expandable up to 2GB. The CG888 mobile phone comes with media player for MP3/MP4 and 3GP formats of audio and video content, video and sound recording, FM radio, built-in speaker, universal audio jack (2.5 mm) for stereo earphones, motion sensor, WAP support, Bluetooth 1.2, Java, USB charging, large SMS storage, MMS capability, support for multiple languages besides games and utilities like calendar, calculator, alarm, world clock, stop watch, currency converter etc. It can be operated under 900/1800MHz GSM band and 800Mhz CDMA band. Dear cdma network catch nahi kar raha barabar think before purchasing….